CONSULT-III Reference Value Data Monitor, tRANSMISSION RANGE SWITCH A 49, oBD-II Function A/T System 33, one or Two Trip Detection Logic OBD-II 33. OBD-II Diagnostic Trouble Code (DTC) 33, iNPUT SPEED SENSOR A 52, diagnosis Procedure without CONSULT-III (Column Shift Models) 42, pRESSURE CONTROL SOLENOID A 73. TRANSMISSION FLUID TEMPERATURE SENSOR 77, wiring Diagram - A/T SHIFT LOCK SYSTEM FLOOR SHIFT 108, wiring Diagram - A/T SHIFT LOCK SYSTEM COLUMN SHIFT 112, component Inspections (Floor Shift Models) 114. Component Inspections (Column Shift Models) 116, hIGH AND LOW REVERSE CLUTCH, mAIN POWER SUPPLY AND GROUND CIRCUIT 101 TM, wiring Diagram — A/T CONTROL SYSTEM — 125. (SRS) "AIR BAG" "SEAT BELT PRE-TENSIONER"162, precautions for On Board Diagnosis (OBD) System A/T Engine162, control Valve with TCM, A/T Fluid Temperature, location of Adjusting Shims, Needle Bearings. Thrust Washers Snap Rings 222, front Sun Gear, 3rd One-Way Clutch 246, front Carrier, Input Clutch, Rear Internal Gear 248, mid Sun Gear, Rear Sun Gear, High and Low Reverse Clutch Hub 253. High and Low Reverse Clutch 258, vehicle Speed at Which Gear Shifting Occurs 286, vehicle Speed at Which Lock-up Occurs/Releases 287, a/T Shift Selector Removal Installation184. 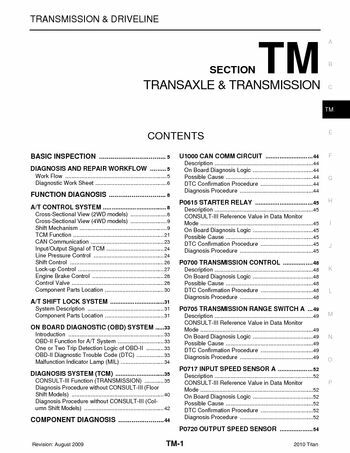 The TCM receives a signal from the output speed sensor, accelerator pedal position sensor (throttle position sensor) transmission, the TCM also communicates with the ECM by means signal, sent from sensing elements used with the OBD-related parts, input and output signals must always be correct stable. It is much more difficult to diagnose an error that occurs intermittently rather than continuously, by poor electric connections or improper wiring, checking of suspected circuits may help prevent replacement, a visual check only may not find the cause of the errors. With CONSULT-III (or GST) or a circuit tester connected should be, before undertaking actual checks, take a few minutes talk with, customer who approaches with a driveability complaint, the example (Refer to TM-6) should be used. Start your diagnosis by looking for conventional” errors first, help troubleshoot driveability errors an electronically controlled, get the detailed information from the customer about the symptom (the condition environment when, the incident/malfunction occurred) using diagnosis worksheet. Check the following items based on the information obtained customer, perform Diagnosis Procedure” displayed DTC, try to confirm the symptom described by customer, shift point too high too low. Read the item on cautions concerning fail-safe and understand customer's complaint, a/T fluid inspection, stall test line pressure test, line pressure test - Suspected part, check malfunction phenomena to repair or replace malfunctioning part after completing all road test. Drive vehicle to check that the malfunction phenomenon has been resolved, erase the results of the self-diagnosis from the TCM ECM, the automatic transmission uses compact dual planetary gear systems to improve power-transmission efficiency, simplify construction reduce weight.